Sometimes it pays to be observant to trends and to follow your hunches. A Sakatchewan woman’s husband thought most lottery winners came from the east. When his wife Tanya Jimmy went on a conference to Halifax, Nova Scotia, he asked her to buy a lottery ticket. 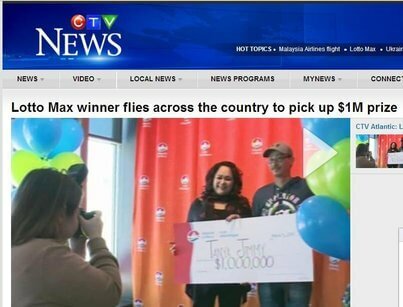 The hunch paid off as Tanya Jimmy’s Lotto Max ticket won a $1 million prize. She was already home when she discovered her win, so she immediately booked a flight back East with her husband Ashley to collect her prize. They want to use the money to pay off debts, do some investing and set up trust accounts for their sons.